1. Schedule a devotional "appointment." Write a specific time and location on your calendar, or in your planner. You might want to choose a time that corresponds with another daily activity: after you get up in the morning, right after school, or immediately after dinner. Try to avoid putting devotions off until the end of the day. 1) A Bible. Biblegateway.com offers 16 versions for you to compare, from that classic King James Version to modern versions like The Message. Or, consider using a student or study Bible—many contain reading plans and practical ways to apply Scripture to everyday situations. 2) A devotional book. Some are specifically for students. Many have a "thought for the day" and questions to help you relate the verses you've read to your own life. 3) A journal. Use it to record your favorite verses and reflections on Scripture. Or, try writing a poem or letter to God. 3. Start with prayer. Ask God to keep you focused and to help you understand what you're about to read. 4. Use your Bible. Even if you use a devotional book with verses printed in it, read the passages in your Bible anyway. "Prove it to yourself that it's really there" It helps you to think of that verse as part of God's Word, and not as just an excerpt from some random book." Plus, you might spot another meaningful verse that wasn't included in the devotional book. 5. Read it until you get it. First, read verse by verse—read each verse several times until you understand what it is saying, then move on to the next one. Then, go back and read the entire passage, putting its meaning all together in your mind. Even if you're familiar with a passage, try to read it like you've never seen it before—don't skim. God might give you an understanding of something you've never noticed before. 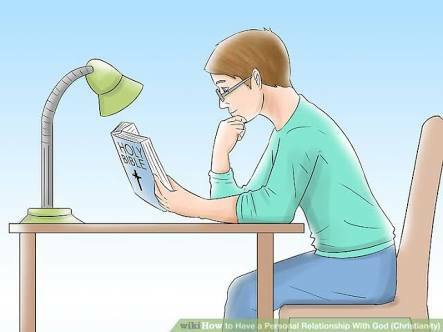 biblegateway.com or a devotional book, find verses about that topic. Then, try to find ways to apply what you've read. 7. Make a commitment. On a piece of paper, write these words: "I commit to read my Bible every day for the next month." Sign your name and tape the paper somewhere in your bedroom where you can see it. 8. Don't give up. Let's face it: There will be days when you skip devotions. Just try to keep it a high priority and do it whenever you can. "God is not going to abandon you if you don't do a devotion one day—he knows what our schedules are like, and he knows our hearts. Any time that you spend with God, he can use it to teach you and to grow your faith.